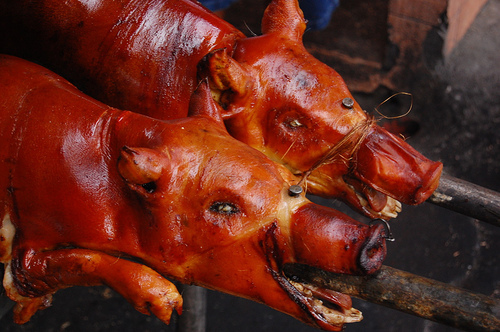 In the Philippines, there are few things that say celebration like a lechon. A lechon is a suckling pig stuffed with herbs, marinated in the lechonero’s secret brew and roasted for several hours over hot charcoal until the skin is a crispy, dark amber. A traditional Filipino centerpiece of any fiesta buffet, everything just seems more festive while tucking into crunch and juicy piece of skin and falling-off-the bone tender, succulent meat. Maybe it’s the time of year or just the need to eat roasted pork. Whatever the reason, my photographer friend Erik and I decide to visit what has been labelled the lechon capital of the Philippines, La Loma. Our hope was to gain a behind-the-scenes look into the creation of this celebrated dish. In the end, we saw and heard much more than we had expected. Please be warned. Some of the pictures are graphic. If you have certain sensitivities toward animals I would suggest that you not view this slide show. If not, please click here. To Serafin Cesario, Ate Rose and the hard working lechoneros of La Loma, many thanks. I agree. La Loma may be the lechon capital of the Philippines if only for the fact that "lechon sellers" are concentrated there but the best lechon in the Philippines is in Cebu. Yes its true. The best lechon is in Cebu. Specially in Lechoncebu.com A very crunchy skin and so tender meat which absorbs the aromatic taste of various fragrant herbs and spices (lemongrass, anise, onions, garlic, etc) stuffed in the pig’s belly. Lechon Cebu serves all over the philippines. D'best talaga ang lechon sa lechoncebu. Gravehh ang sarap. Walang katulad. Yes you are right. Laloma is only a lechon capital but the tasty lechon was in cebu. Lechon cebu taste good. The meat was tender and juicy and the crunchy skin was yummmy. It is very delicious. Nothing beats the taste of lechon cebu. The tasty meat and crunchy skin taste good. Lechon cebu is the best lechon in the Philippines. Number 1 talaga ang cebu's lechon. Grabeh! No wonder y people from manila came to cebu just to eat lechon. Ang sarap talaga ng cebu's lechon.